Chickenpox parties aren’t so fun after all. A few weeks ago, I stumbled across the Facebook group “Chicken Pox Parties—New York Metro Area.” It has 143 members, all of whom, I’m guessing, are parents who have chosen not to vaccinate their kids against chickenpox and instead hope to build their kids’ immunity the old-fashioned way, by directly exposing them to the germs of a pox-infected child. They are not alone: Facebook has 14 other chickenpox party groups organized by geographical region, and if you can’t get to one in person, you can always ask to be sent a lollipop with an infected child’s spit on it. Perhaps these parents go this route because they’re distrustful of the vaccine or they think that inoculating against chickenpox is dumb. For those of us who endured chickenpox as kids and emerged relatively unscathed, the varicella vaccine, as it’s called, does at first seem kind of dumb—another unnecessary medical intervention being thrust upon us and another box to check off on the never-ending paperwork that is raising a child. So should we say no to our pediatricians and bring a pox on all our houses instead? After evaluating the medical evidence, my answer is an emphatic no. The shot is by far the better way to go. 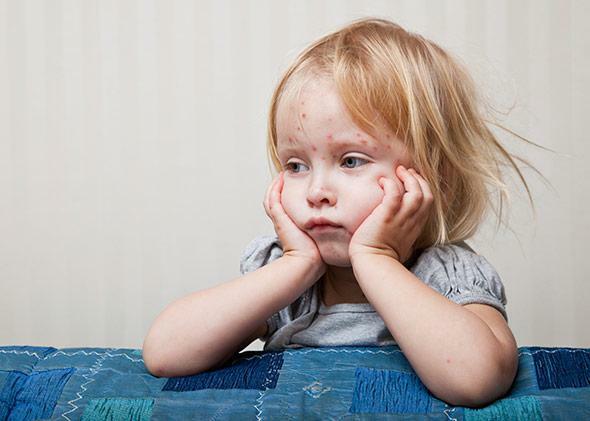 That’s because although we might recall chickenpox as a small but annoying blip on our childhood radar it can be dangerous. True, before the vaccine was licensed in 1995, only about 100 to 150 American kids died of chickenpox every year, and most of these children had underlying immune system issues. But every year, chickenpox landed about 11,000 kids in the hospital. It’s not that they couldn’t handle all the itching; one study from Europe (where many countries do not vaccinate against chickenpox) has found that one-fifth of all otherwise healthy kids who are hospitalized for chickenpox suffer neurological problems such as strokes, meningitis, convulsions, and encephalitis. Chickenpox can also cause septic shock, pneumonia, necrotizing fasciitis (that’s flesh-eating bacteria), and other bacterial infections. There’s also evidence to suggest that the vaccine staves off shingles. Chickenpox is a herpes virus, which, like the kind that affects your lips and nether regions, sits latent inside your cells after an initial infection until something causes it to flare up again. Seniors are at a high risk for suffering these chickenpox-related flare-ups, called shingles, which can cause terrible, long-lasting pain. (About half of all 85-year-olds have had it.) Kids and adolescents can get shingles too, though it’s rare. And a 14-year-long study found that kids vaccinated against varicella were 39 percent less likely to get shingles as youth than were unvaccinated kids who had naturally caught the infection. No one yet knows, however, whether this extra shingles protection will last until old age because the chickenpox vaccine hasn’t been around long enough—its earliest recipients are still pretty young. Does the vaccine pose risks, too? Of course; every medical intervention does. But the risks associated with the vaccine are much lower than the risks associated with infection. The Centers for Disease Control and Prevention and the Food and Drug Administration monitor potential vaccine side effects using the Vaccine Adverse Event Reporting System. VAERS isn’t perfect. For one thing, it doesn’t record problems unless patients or their doctors report them. The complaints about the varicella vaccine that get recorded in VAERS aren’t always caused by the varicella vaccine, either. For instance, if a person falls ill soon after getting the shot, it’s possible that the timing is simply a coincidence—maybe the child was catching the flu anyway. Moreover, about half of VAERS complaints about the varicella vaccine describe problems people experience after receiving varicella along with other vaccinations, so it’s impossible to know which vaccine caused the reaction. Even though the system is imperfect, the numbers suggest that the varicella vaccine is much safer than the infection. VAERS found that between 1995 and 2005, 0.052 percent of people who got the varicella vaccine—that’s 52 out of every 100,000 vaccinees—complained about complications, most of them minor. These included rash (17 out of 100,000), fever (11 out of 100,000), and pain at the injection site (seven out of 100,000). More rarely, the vaccine was associated with diarrhea (1.7 out of 100,000) and convulsions (1.8 out of 100,000 ). And yes, the vaccine was associated with 60 deaths during that decade (one out of every million doses), but most occurred in children who had serious congenital problems or immune-related deficiencies and who should never have gotten the vaccine in the first place. Ten of these deaths were categorized as “crib deaths”—basically, SIDS—so it’s impossible to know whether the vaccine caused them. Comparing the stats more directly, your kid has a one in 400 chance of ending up in the hospital after catching chickenpox at a party or a one in 2,000 chance of suffering a (likely minor) side effect after getting the vaccine. Death, while rare either way, is also far more likely from chickenpox than from the vaccine. And don’t forget that kids who get the vaccine are 39 percent less likely to suffer shingles as a child or teen. Vaccine 3, pox party 0. There are other reasons to give your child the vaccine, too. As more and more kids get vaccinated against varicella, the chances of planning a successful pox party drop: There are simply far fewer kids out there getting—and transmitting—chickenpox. You’ll have to work on that invite list a long time before you find your “patient zero.” And the longer it takes an unvaccinated child to catch the infection, the more dangerous that infection becomes, because more severe cases of chickenpox tend to occur in older kids. And vaccination may pose a public health risk that, paradoxically, further supports the idea that you should inoculate your kid. Some researchers posit that people who catch chickenpox as kids should be re-exposed to the virus throughout life to boost their immunity; research suggests, for instance, that adults who are frequently exposed to chickenpox are less likely to develop shingles. Since so many fewer kids are running around with chickenpox now, some researchers worry that this immune-boosting effect is disappearing and that those of us who had the infection as kids are going to experience a “major epidemic” of shingles in the coming years. (This is partly why, in 2006, the CDC began recommending a single dose of shingles vaccine for adults over the age of 60—the idea is that the vaccine will help provide the missing immune boost.) This potential problem—while still unproven—could be a public health drawback to widespread varicella vaccination, but when it comes to deciding what to do for your child, the shot seems the obvious choice, since it seems to substantially reduce shingles risk compared with infection as it is. So is there any reason not to give your kid the varicella vaccine? Sure. The vaccine is generally not advised for sick kids, those with immune-related conditions such as HIV or cancer, kids who have recently had transfusions, those who have been on immune-quashing steroids for more than two weeks, and children who have had allergic reactions to previous doses of the chickenpox vaccine or have allergies to gelatin or neomycin. (These unvaccinated kids, by the way, rely on herd immunity to keep them safe from infection—so by choosing not to inoculate your child, you’re also putting these already at-risk kids at more risk.) Otherwise, though, the shot is a no-brainer. It is highly effective and poses far fewer risks than the infection does. Plus, it may reduce your child’s risk of shingles. And now that so many kids are being vaccinated against chickenpox, parents who opt for pox parties, or who blithely assume their kid will be infected at school, might end up with a very sick older kid one day. I know that it’s tempting to think, That’s silly; I didn’t have the vaccine, so my kid shouldn’t need it either. But you might as well be saying that your kid has no right to a healthier, safer world than the one you grew up in—and that sounds far sillier.